Wicken Beer Festival - Saturday 12 May 2018 | Come join us for Beer, Cider, Wine, Food, Live Music and Laughter – 12 May 2018. The Wicken Beer Festival is an annual fund raising event run by volunteers to raise money to maintain and develop the local recreation ground. Are you feeling blue on this delightfully cool and breezy Sunday? Do you have those post Sunday-dinner, “argh it’s Monday tomorrow” feelings? 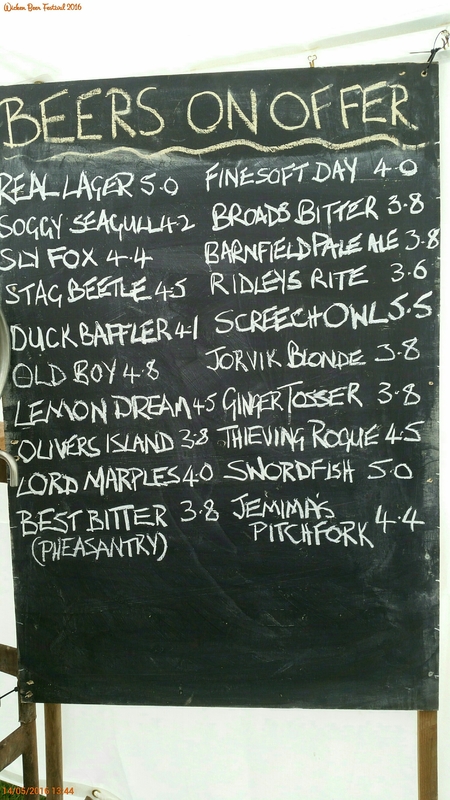 Well have no fear, our beer list is here!! In Band News we have confirmed that Sabertooth Timmy will be playing our evening slot. We’ll be back with you on 12th May 2018 for the 15th Wicken Beer Festival. Hasn’t that time flown by? We’ve been through this so many times already we’re hoping you’ve all got the basics by now. But, if you’ve been on Mars here’s what you’ve got to look forward to this year. We will be back yet again with more beer, more cider, more BBQ and more great music. Let’s keep our fingers crossed for great weather too. 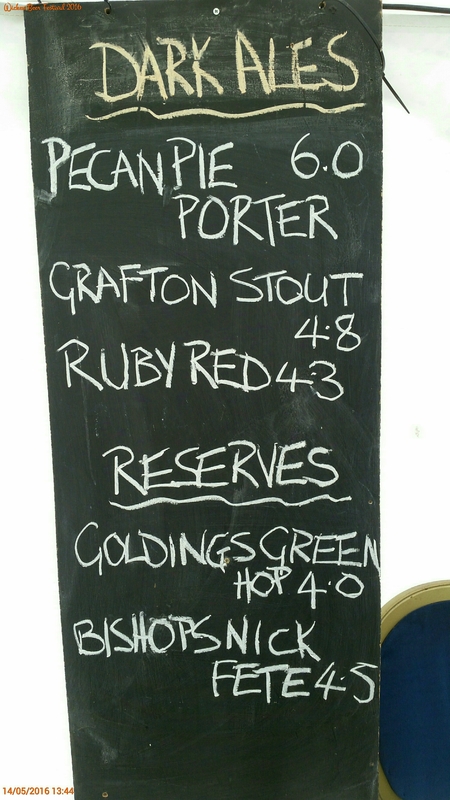 As usual we will be pouring 22 different ales, including a Real Lager and local cider. They will be £3.50/pint (2 tickets) or £2.00/ half pint (1 ticket). Don’t forget to buy your tickets at the stand before coming to the bar. We will publish our Beer List closer to the day. There will obviously be plenty of Tyler’s burgers and hotdogs to soak up all those pints. Filling our early music slot we have Gravel Road who will be playing roughly 5.30 til 7.30. Our late slot from around 9 to 11.30 is still to be confirmed. New to us this year we also have Tony Chouler entertaining you between our main acts. That’s plenty of great music so make sure you’ve got your (sensible) dancing shoes on. As this is a family friendly event, we encourage you to bring the kiddies and explore the whole recreation ground including the new outdoor gym equipment and Zip wire. However, please be careful with these later on in the evening. Feel free to also bring balls, bats and rackets and make the most of what previous Beer Festivals have raised funds for. However, please don’t bring the dog. Speaking of volunteering, if you’ve got a spare hour on Thursday 10th May come and lend a hand putting up the marquees from 6pm. Please do say hello and introduce yourselves, it’s good to talk. Car parking is provided as usual in the field on Lower Road – follow the signs. The Recreation Committee have come together to discuss our options going forwards and if we could pull off more festivals in the future. Luckily the answer was a resounding YES! So, we can announce that the 2019 Wicken Beer Festival will be held on Saturday 11th May from 4pm til midnight. As we get closer to the day we will update you on the finer details of bands and beers so keep an eye on our Facebook and Twitter pages. 1. As it looks like we’ll be getting some rainy showers in the afternoon, appropriate footwear and clothing would be wise. However, if you do decide to wear your stiletto’s and you get them stuck in the mud, you will at least provide a good laugh for anybody that spots you. Bring a brolly! 2. Please don’t bring your dog! Who doesn’t love dogs?! BUT we hold the Beer Festival on the Recreation Ground where kids and adults alike play sports and have lots of fun, so unfortunately dogs are not allowed. Please don’t bring them. 3. There will be some seating (and marquees for shelter) provided but it is always a good idea to bring some of your own camping chairs or blankets (weather permitting). 5. There is free parking off Lower Road. Cars can be left there over night but the owner kindly asks that you collect it ASAP in the morning. Want something to cheer you up on this cool and gloomy Monday? Ahhhh Well just writing this list has cheered me up! Dancing Ducks, Screeching Owls, Ghost Ships and Big Willies. Hopefully there is something for everyone, so what’s not to love? Sorry about the delay this year with updates but we’re hoping you’ve all got the basics by now. We will be back in under 2 weeks with more beer, more cider, more BBQ and more great music. Let’s keep our fingers crossed for great weather too. 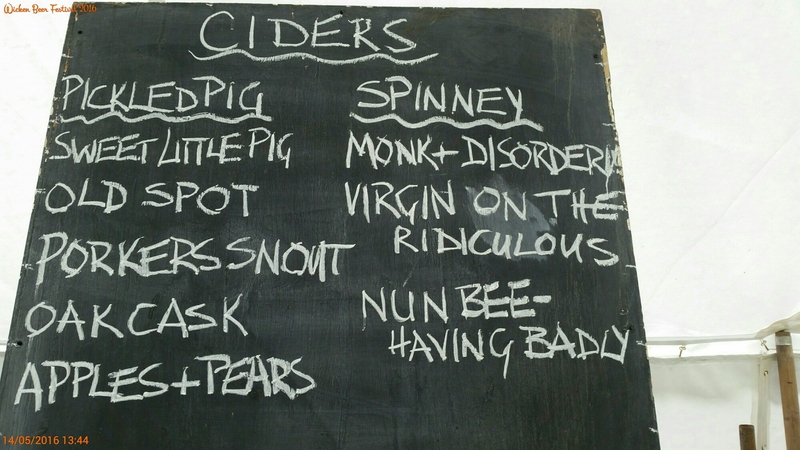 As usual we will be pouring 22 different ales, including a Real Lager and 3 Spinney Abbey ciders – Monk and Disorderly, Virgin on the Ridiculous and Nun Beehaving Badly. So far, we are unsure if we will have any Pickled Pigs ***sobs***. This year they will be £3/pint (2 tickets) or £1.50/ half pint (1 ticket). Don’t forget to buy your tickets at the stand before coming to the bar. We will let you know what beer we’re getting closer to the day. There will be plenty of Tyler’s burgers and hotdogs to soak up all those pints. Filling our early music slot we have Akimbo who will be playing roughly 5 til 7.30pm. They’re a great, Cambridgeshire based band who will be doing some Classic Rock and Pop covers. The Dinosaurs, a Newmarket based band will be doing our late slot from around 9 to 11.30. Plenty of great music so make sure you’ve got your (sensible) dancing shoes on. This year we will have some new faces volunteering their time to help our cause by serving pints, flipping burgers and selling tickets. Please do say hello and introduce yourselves, it’s good to talk. Speaking of volunteering, if you’ve got a spare hour on Thursday 11th May come and lend a hand putting up the marquees from 6pm. As this is a family friendly event, we encourage you to bring the kiddies and explore the whole recreation ground including the “teenage zone”, play equipment, MUGGA and huge playing field and wood. Bring balls, bats and rackets and make the most of what previous Beer Festivals have provided. However, please don’t bring the dog. We hope you have all managed to warm up and dry off after this horrible half term weather. Firstly, we’d like to say a massive Thank You to everyone that came out despite the chilly breeze and lack of sunshine and supported us 3 weeks ago. We had an awesome, if not tiring, time as always. The large variety of beer and cider kept you all coming back for more and more and more and …… well you get the picture! Cheese burgers and hotdogs were devoured to provide the vital sustenance to allow you to continue on and dance the night away. Tantris kicked off the evening’s entertainment and provided the perfect backing track to enjoy time with friends and family. The 142’s Band led us into the night and allowed you to let your hair down and boogie. Alan Gamble‘s photos from the evening can be found on Facebook here if you haven’t already had a look. Photos that were taken by us are also on our Facebook page. Apart from a few minor issues and a couple of minor idiots everything went as planned. Clean up the next day was helped with copious amounts of tea and coffee, as well as bacon butties. So far we are looking at roughly £4500 profit to go towards funding further improvements to the Recreation Ground. We can’t wait for the new equipment to get erected. We would also like to thank all the people that come down and helped us erect the marques, provide seating, lighting, etc. and let’s not forget the portable toilets. To the volunteers who man the bbq’s and Crisps areas, you were awesome and kept us fed nicely. Another big thanks to those selling the drinks tickets and the champs behind the bar, without your dedication and continued enthusiasm it wouldn’t possible to hold this event. Above all – Again a massive THANK YOU to all of you who attended and especially the regulars that come every year. Thanks again! We hope to see you all on 13 May for Wicken Beer Festival 2017. Click here for the 2016 Event Photos – Please have a look through the photos and tag everybody you know. Christmas Idea: Please support us by Pre-Ordering your Camra Good Beer Guide 2017 at http://amzn.to/24oYIwK as a christmas gift. Nun Beehaving Badly was launched just 2 months ago, on 18 March 2016, at a party at the Five Miles from Anywhere No Hurry Inn. Feel free to read the article featured in Ely-News here. Which of these have you got your eye on? We would love you to interact with us on here in the comments box and on Facebook & Twitter. Let’s get a conversation started. Hurrah!! We’ve finally gotten hold of our Beer List for 2016. As always we have a good variety for you to get your taste buds round. We’ve only got a few days to go and lots to do until then. If you’re available on Thursday night we will be erecting the marques and will need all the help we can get to make it as quick and as easy as possible. Please come down and lend a hand if you can. See you all soon. On Saturday 14th May, Wicken Recreation Ground will be the venue for the 13th Wicken Beer Festival run by a group of volunteers from the village to fund raise for play equipment. Over the years the group have managed to install a multi-use games arena, installed play equipment and supported local groups who use the facilities. This year two local bands will be entertaining the crowds. Tantris will be playing the early slot from 4.30pm with The 142’s playing from about 8pm, whilst they enjoy a variety of real ales, locally produced cider and BBQ supplied with meat again from a local supplier. Soft drinks will also be available for those designated drivers and families who enjoy the informal friendly atmosphere. The Event is totally run by volunteers and the large area of grass provides plenty of space for families to spread-out and for children of all ages to enjoy games of football, cricket and kite flying. With several marquees providing additional cover and seating there is plenty of space for everybody to enjoy the atmosphere, beer and music. We do ask that dogs are left at home please. Free Parking is available adjacent to the recreation site and entry is free. 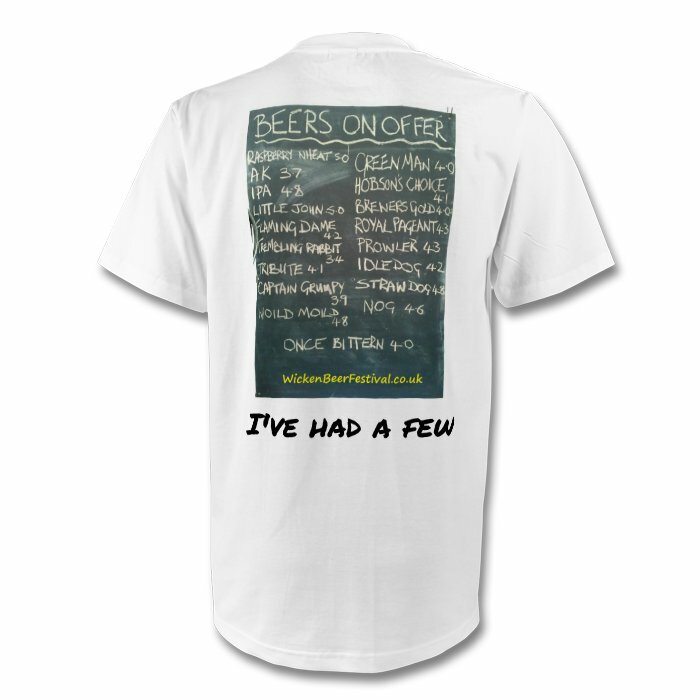 Please visit our website for more information www.WickenBeerFestival.co.uk for the latest information. If you follow us on either Facebook , Twitter or have subscribed to this website you’ll have noticed that this years Festival is on the 14th May 2016. As always it’s all kicking off at 4pm and running through until midnight or until we run out of beer and cider (like last year!). I’m sure you are all familiar with how we do things, after all we have been going for over ten years, but if you’re new to us, here is a brief run down. We will have an excellent variety of beers from around the UK as well as locally produced and award winning Spinney Abbey Cider from Wicken and Pickled Pig Cider from Stretham. When you get hungry we will be serving up Wicken’s own Tyler’s sausages and burgers. 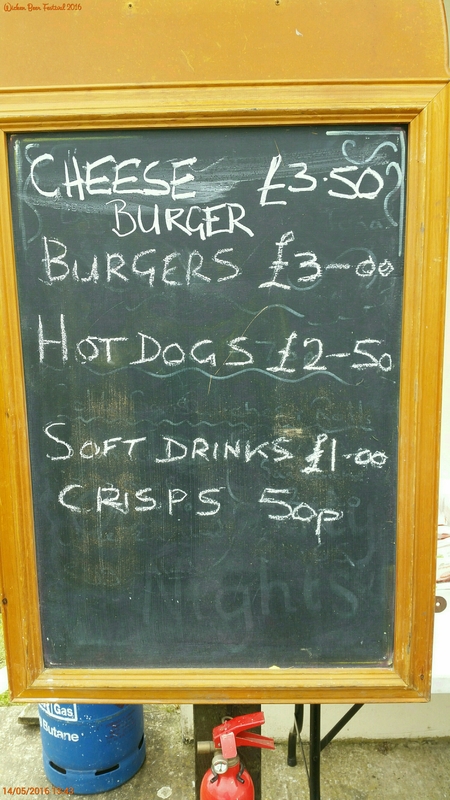 Soft drinks and crisps will also be available. The 142’s band is the first band we can reveal to you. Another will be announced as soon as they have been confirmed. They will be playing throughout the afternoon and into the evening, so make sure you’ve got your dancing shoes on. Entry and parking are free. In case of rain we have marquees in which to shelter, but with so much space there is plenty of room for people to bring their own gazebo’s and chairs if they wish. We encourage you to bring some balls and bats for the kids and maybe a picnic blanket for yourself, but could we ask you politely to refrain from bringing any dogs. Come rain or shine, we look forward to seeing you there. What can we say? Saturday was amazing and far exceeded our expectations. It was our best festival yet, both with funds raised (more in a bit) and fun had. In fact, you were a very thirsty and hungry lot and managed to drink the last drop of beer, cider and wine. The burgers and hotdogs also sold out completely. Plus all the soft drinks and crisps. We hope your heads didn’t feel too bad on Sunday morning, although we’re not too optimistic there. We heard so many lovely comments from people about the variety of beer, the quality and general yumminess of the cider – especially the Toffee Apple (I agree there) – and the bands. As always it was great to see loads of local people and lots of new faces out soaking up some sun and having fun. It was especially lovely to see lots of children enjoying the facilities we work hard for. Thank you to both the bands who played on the night. Tristan and AJ kicked us off with an acoustic set playing throughout the sunny afternoon. We listened to The 142’s Band play whilst the sun went down and you just kept on drinking. Thank you to everyone that came out to support us. We managed to take around £10.592 on the night which is a record for us. When we have word of what our profits are we will let you know. Up on our Facebook page you can now find Alan Gamble’s photos from Saturday night. As always we’re very grateful to Alan for being our officially unofficial photographer. Have a look by clicking HERE. Some of our own photos can be found on Facebook or Google+. If you see yourself and want to Tag the picture please do. It’s nice to put names to faces. We just wanted to remind you of a few things to remember before you all come over tomorrow. 1. Although the weather is looking good at the moment, please remember to bring warmer clothes if you plan to stay past dark. If you get chilly, just have a good dance to warm yourself up. 2. We hold the Beer Festival on the Recreation Ground where kids and adults alike play sports and have lots of fun, so unfortunately dogs are not allowed. Please don’t bring them. 3. There will be some seating provided but it is always a good idea to bring some of your own camping chairs or blankets to spread out over the field. 4. We would love to see lots of kids using the equipment we’ve worked hard to get installed so please bring them with you and any balls, bats or rackets you want. There’s loads of space.